Welcome to the official launch of Starbunny, Inc! I couldn’t be more excited to finally start sharing this new comic with you! Even though it’s about rabbits, stars, corporate takeovers, and intergalactic quests, I’ve really put a lot of heart and soul into this whimsical story. Starbunny is all about the crossroads of life, finding one’s passion, building your own destiny, redefining family, and choosing the people you want to join you on your quest. All of which could not be more relevant to where I am in my life right now! Despite some ups and downs over the past few years, I’ve been fortunate to have the opportunity to make exactly the kind of comics I’ve always wanted to, and meet tons of amazing people along the way. 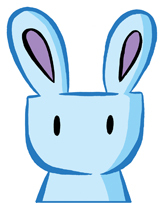 I’m hoping that producing Starbunny for the web allows me to connect with even more people throughout the universe! So thanks to you for stopping by, and I hope you stick around for the ride! Here’s a sneak peek at an upcoming page! BTW: Current schedule for updates is Wednesdays and Fridays! Published in News by Dave Roman | No Comments on A new era!